We are an association of individuals interested in the caddy spoon as an area of collecting. The Society was founded in 1963, and has an international membership. Our aim is to promote the study and collection of caddy spoons of all types. 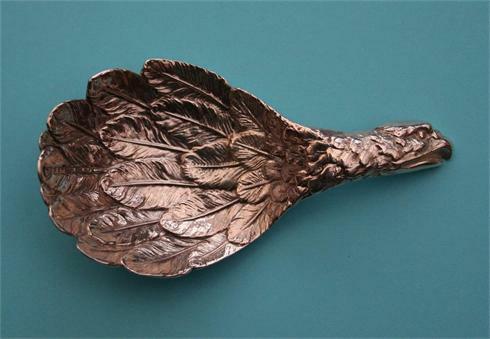 The Emblem of the Society is a representation of one of the most famous Caddy Spoons – the highly collectable ‘Eagle’s Wing’, first made by Joseph Wilmore in 1814. (Later versions, notably by Matthew Linwood a few years later, are also to be found, and are of similar value to collectors.) Another maker was George Unite in the 1860s. The ‘wing’ is the bowl, formed of highly detailed, individually modelled overlapping feathers; the head of the eagle, also beautifully modelled, forms the handle. The two pieces were struck separately in these early pieces, and then the handle skilfully soldered to the bowl, with a virtually undetectable join. There is also a London-Assayed 19th Century Eagles Wing, by Barnabus Blackburn. It is the only known example of a London-assayed Eagle’s Wing, and is in a London Museum. Modern, usually cast, versions of this spoon occasionally come up for sale, and fetch relatively high prices. New collectors, realising the likelihood of finding an early example to be slim, settle for the modern spoon, hoping to replace them later in their collecting career. Amongst these makers are Vanders in the 1960s, C Ltd of Birmingham and Sheffield in the 1980s. Recently a Roberts and Belk example has also been found. Use the form on this page to find out more about the Society or enquire about Membership. Important: The information you supply will be used ONLY to forward details of the Society to you. It will not be shared with any other organisation or individual, and will be held in full compliance with the General Data Protection Regulation.